The Preferences widget within the SoundBridge: DAW is a place where you can set up all the essential parameters needed for a flawless user experience. In the first part of the Preferences widget tutorial, we will cover Audio, MIDI, VST, and Blacklist. In this SoundBridge tutorial, I will cover the Audio section which is located in Preferences. You can enter the Preferences section by clicking on the “Preferences” tab in the lower left corner of main SoundBridge`s interface, which I marked in red. In addition to this, you can press “P” on the keyboard and enter Preferences. So, If you click on the Preferences tab or press “P” on the keyboard, you’ll enter the preferences window. 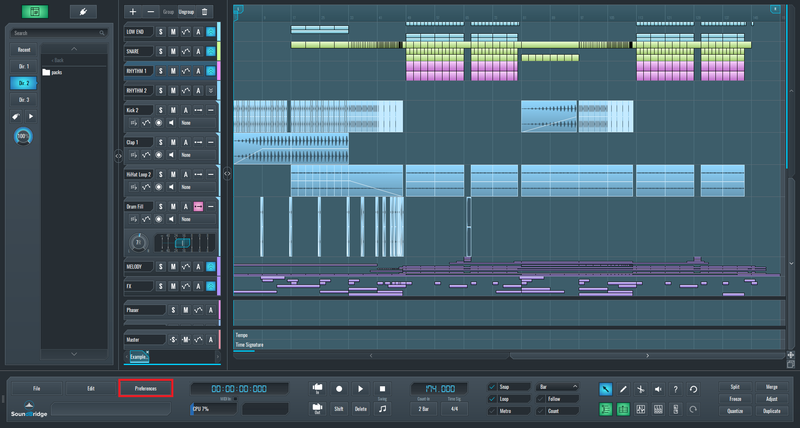 Here, the “Audio” section is highlighted in blue. First in the line of audio settings is the “Soundcard Driver.” This feature sets the audio driver and the interface used for playback and recording. By clicking here, you will enter a submenu with the available audio driver list. In most cases, we recommend using the sound card driver “ASIO” developed by Steinberg, which stands for audio streaming input-output. Moreover, if you do not possess an external sound card which allows the ASIO driver, a second option would be to select “MME” or “DirectSound” driver which is native to the built-in soundcard of your computer. 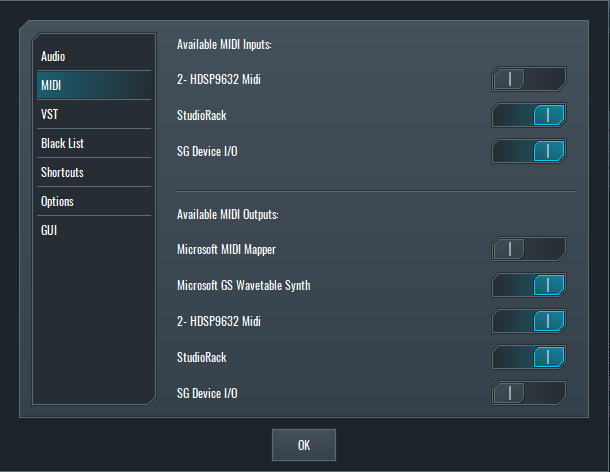 Below the Sound Card Driver, we can see the “ Device” tab where you should select the audio interface you wish to use. The “Input/Output” button activates or deactivates input and output channels on your device. 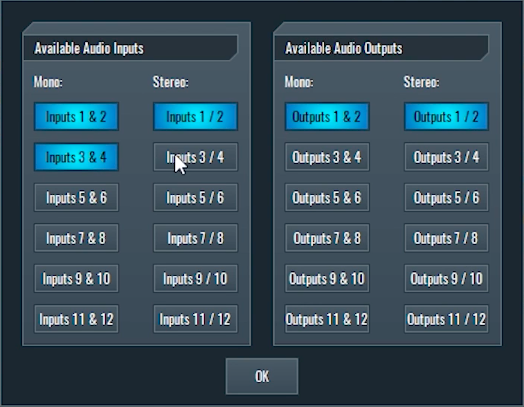 For more advanced configuration you can enter the “Control Panel” next to the “Input/Output” tab which will take you to set up of properties of your audio device. 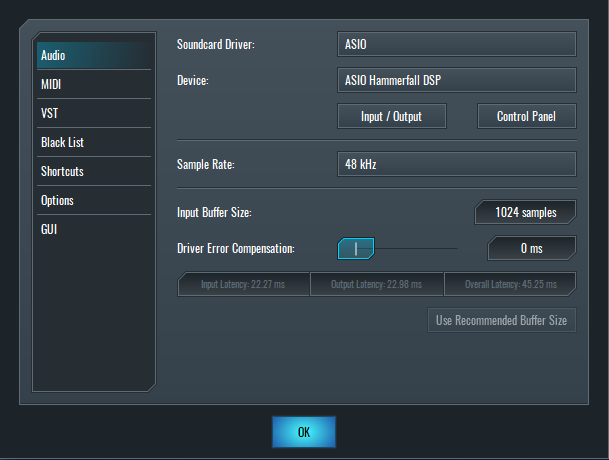 Here you can set the overall latency and all other options that your sound card possess. Next setting is the “Sample Rate” which allows you to set the desired sample rate. By default, the value of 44.1 kHz is presented. So, by clicking this tab, you are transferred to another submenu. 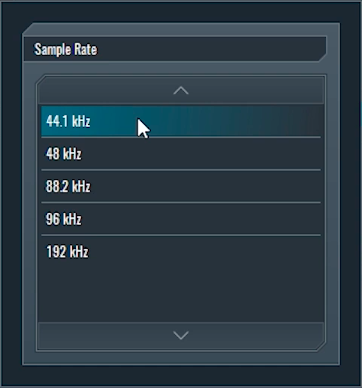 In it, you can see your sound card’s available sample rate values. This will be the rate at which the audio will be sampled in your project. You can think of this setting as the resolution of the audio frequency range. With more resolution value you will get more accuracy but at the cost of CPU usage. Bear in mind that higher sample rates require more processing power. 44.1 kHz is a standard sample rate for music, and it is the sample rate that we experience in most of the professional music productions. Below this section, we can see the input buffer size section. Input buffer size sets the size of the buffer that SoundBridge will use when processing input. Smaller buffer size yields less latency but demands higher CPU usage and vice versa. Driver error compensation slider will allow you to compensate for latency introduced by plugins during recording and ensure that the audio routed thru them stays in sync with the project. Latency display shows last updated overall latency and the division between input and output. The last feature in this section is the “Use recommended buffer size” tab. It changes the buffer size by making calculations between the current latency and CPU usage. 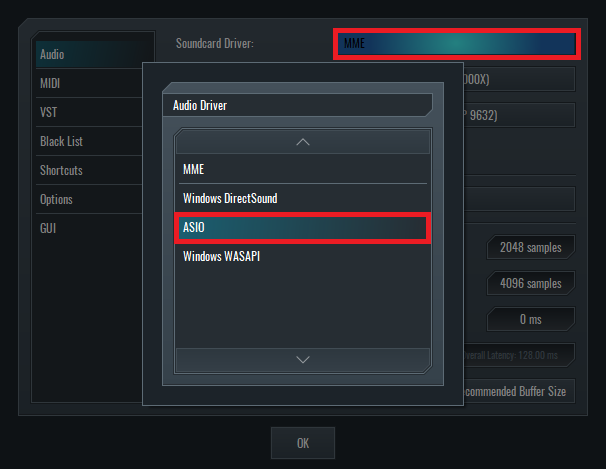 If ASIO driver is not available, you can select one of the Windows-based audio drivers in the sound card driver menu like MME or Direct Sound. After choosing one, you can also choose different input and output devices. The audio panel will slightly change when you select a windows driver. It will show you a flexible and separate input and output buffer size sizes. However, driver error compensation, latency display, and use recommended settings button functions will remain unchanged. MIDI section panel allows you to engage or disengage the available MIDI devices (MIDI controllers, synthesizers and external devices). Check out an example of the listed MIDI (input and output) devices in the picture below. After the audio section lets move to the VST section. 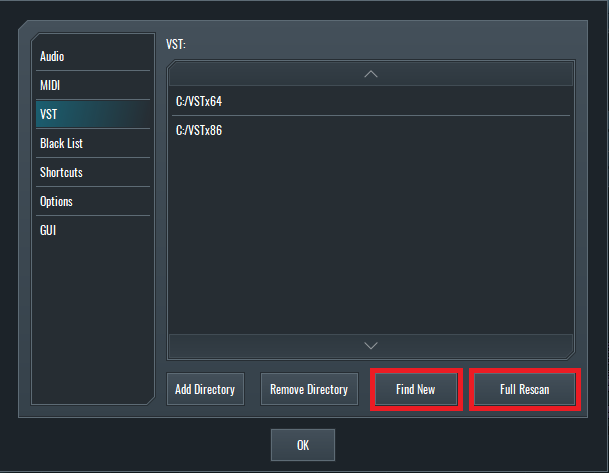 The VST section will allow adding or removing directories that contain VST plugins. They will be scanned upon starting SoundBridge or by pressing the “Find new” or “ Full rescan” button. The “Find new” button will just scan for newly installed plugins, while “Full rescan” will rescan all the plugins in the directory that you added to the list. 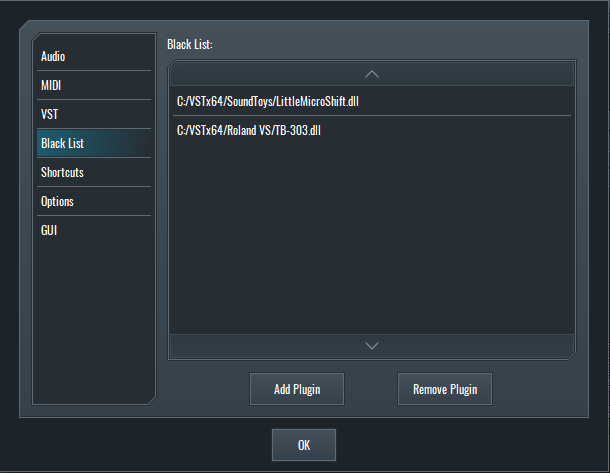 Black list allows adding plugins that you want SoundBridge not to scan in case they cause problems. In fact, if SoundBridge crashes during startup when scanning plugins, it will automatically offer to add the problematic plugin to the blacklist on its next startup.